The tune for Mozart’s Variations on Come un agnello, K460, comes from Sarti’s opera Fra i due litiganti il terzo gode (While two dispute, the third enjoys). The plot of the opera, composed in 1782, resembles that of Mozart’s Le nozze di Figaro (1786), with its Romantic high jinx among aristocrats and their servants. More importantly, ‘Come un agnello’ was sufficiently well known in its day for Mozart to famously quote it again three years later in Don Giovanni: it is the second of three popular tunes played during the supper scene (followed by 'Non più andrai' from Figaro). As evidenced by the finale to his Piano Concerto in C minor, the variations form provided a potent vehicle for Mozart’s inexhaustible imagination; this set affirms the same. 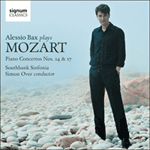 Mozart transforms Sarti’s straightforward melody over eight beguiling variations into something exceedingly pleasing indeed.